Okay, first things first. Using Random.org I've drawn two names from those who left comments to win Spice Up Your Life. And the winners are...Nina Timm and Katie! Congratulations, ladies. I'll e-mail you right away to get your mailing addresses. And if you're like me and almost never win anything, I have a consolation prize in the form of a great cold pasta salad which I've been taking with me to school for the past few days. It's vegetable rich, with broccoli, mushrooms, tomatoes, and pesto. But the really wonderful technique I learned from this recipe is using two long strips of lemon peel in the boiling water while cooking both the broccoli and the pasta. 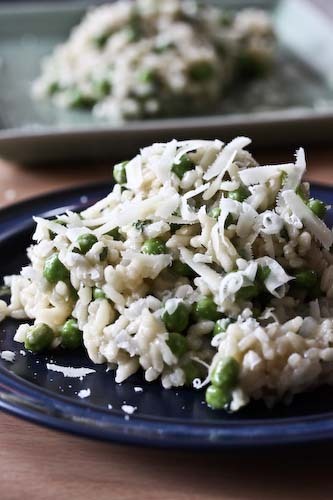 It adds a wonderful aroma of lemon that permeates the salad, especially when fresh. This isn't my normal pesto, and I think I prefer my usual recipe. Also, next time, I might substantially increase the amount of pesto I use. And process until the mixture is a coarse texture. Add a pinch of salt to taste. Remove the broccoli flowerets from the stalks and break the flowerets into bite-sized pieces. Peel the stalks with a vegetable peeler, and cut those into bite-sized pieces as well. Place the lemon peel in a large pot with plenty of boiling water. Add salt and the broccoli pieces and cook until the broccoli is tender-crisp. This will take about 5 minutes. Remove the broccoli with a slotted spoon, but keep the water boiling. Transfer the broccoli to a colander and run under cold water to stop the cooking. Add the rigatoni to the boiling water and cook according to package directions. Drain in a colander when done and run under cold water to stop the cooking. In the meantime, sauté the mushrooms over high heat in the oil for around 5 minutes, or until your desired doneness. Season with salt and pepper. 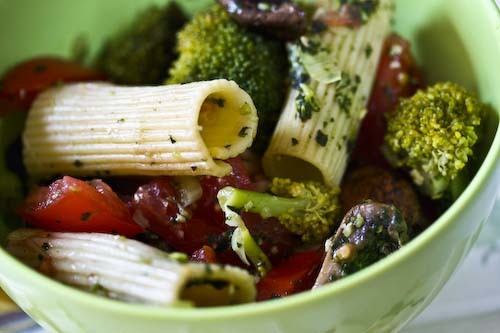 Gently toss the rigatoni with the pesto, broccoli, mushrooms, tomatoes and green onions in a large bowl. Add salt and pepper to taste and serve. I love the consolation prize! This is such a pretty pasta. This is so pretty! What a lovely summer salad and I will have to try adding the lemon peel next time I make pasta or boil veggies. I have tried to email you twice, but it keeps coming back. I used the email address you've sent!! !